I was always a pink kind of girl. Pink shirts, pink socks, pink barrettes…even the decor of my bedroom was pink. I was a pink kind of girl even though I was a bit of a tomboy too. For a while, in my teens and early twenties I traded in the pinks for darker, plainer colours, but over time I have come to embrace the colour once again. Which is something you almost have to do, living in Japan. The cherry blossoms are here. They officially opened today here in Kyoto, although it will be another week before they will be at their peak. Over the years in Japan I have both been enamoured and indifferent to the coming of these delicate blossoms that appear year after year. This year I find myself more caught up with them than usual, and I take that to be a good sign. Sometimes one gets into a bit of a creative funk, whether it be writing or photography or whathaveyou, and it takes a while to get out of it. In some ways I feel like I’ve been in a creative low for almost 5 years, and it’s just now that I feel the urge to try new things, even if means starting with the old. 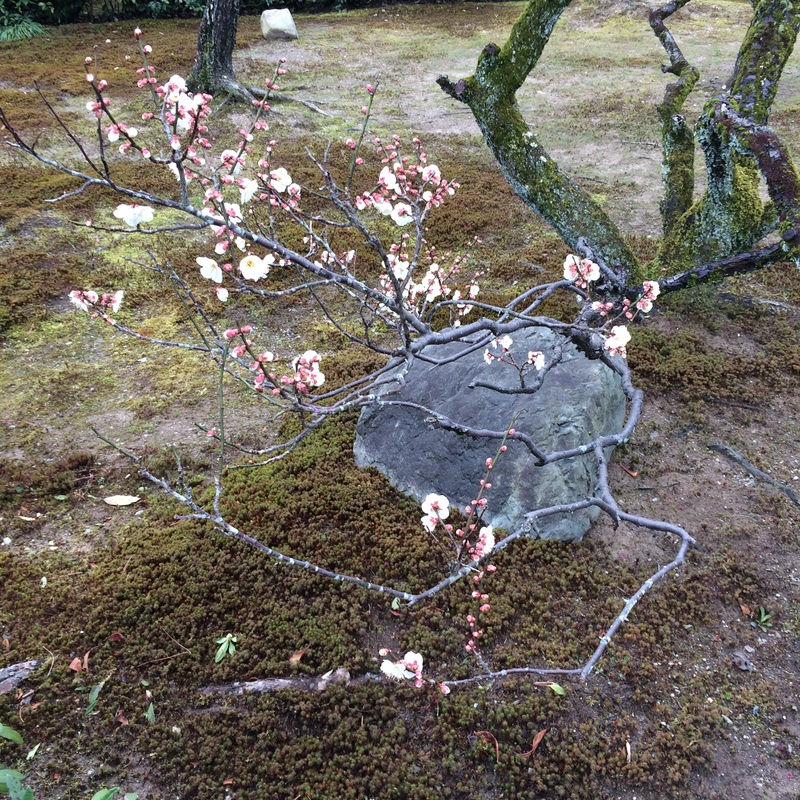 Because I like the underdog, I’ve actually been focusing on plum blossoms this spring. In the past they were much admired and anticipated by the Japanese, but now they are generally seen as a precursor, a warm-up act before the main attraction. That’s too bad, because in many ways they are just as beautiful, if not more so, than the illustrious cherry blossoms. I like the plum blossoms because they have a much more dynamic range of colours, from pale pinks to hot pinks, and unlike cherry blossoms, they have a beautiful, rich scent. They were just beginning to open at Kitano Tenmangu Shrine a few weeks ago. However last week I went to Zuishin-in Shrine where they were about 30% open, but across town they were at their peak at Jonan-gu shrine. And while there were plenty of people at both places, they were not packed the way other temples and shrines will be in the coming weeks for the hanami season. In any event, it will be a good reason to burn through the rolls of slide film I have languishing in my fridge, lonely and expired since my focus is usually on black and white film. The forest of pink looks fabulous.